"I wrote this review 10 years ago, but now 10 years later Elena helped me with another real estate transaction and she is 10 times more excellent. As an anxious perfectionist I have always been uncomfortable looking for a home. However, my home search with Elena turned out to be one of the best experiences of my life. She not only is a professional, intelligent, punctual and caring agent, she is a great friend who makes the most stressful situations seem enjoyable. Thank you, Elena, I wouldn’t have been able to do this without you. So I will be knocking on your door if I ever need help from a real estate broker. "You set my standards so high that I don't think I could ever work with any other agents other than you." "Elena is a pleasure to work with. She is highly professional, extremely knowledgeable, effective, efficient, proactive and responsive. She is a tireless advocate for her clients’ interests and is open and honest in all her dealings. For me, she went above and beyond to overcome countless obstacles and hurdles to get the deal done. I would recommend her highly and without hesitation." "Elena Gorbounova just proved she is not only a five-star pro at purchase and sale of real estate but also a five-star pro at finding suitable tenants for rental properties. I had TWO 2-bedroom apartments in the same condo complex come vacant at almost the same time, at an unfavorable time of the year for rentals and in an area with stiff competition for tenants from much newer condo and rental buildings. Elena didn’t take the easy way out and urge me to go with the first prospect who came along. Instead, she insisted on getting “quality tenants,” and she did extensive due diligence to make sure i did not end up with problem tenants barely able to afford the rent and/or with less than satisfactory reports from prior landlords. She also provided valuable guidance on how to improve the presentability and attractiveness of my units. success was not instant but her determined approach paid off with both units being rented within three days of each other. On the basis of my own experience, i can, without hesitation, recommend elena to all landlords seeking tenants, and i have a high degree of confidence that her performance on purchase and sale transactions will be equally stellar"
"I am extremely pleased to provide this review on the services I received from Elena Gorbournova in the sale of my condominium. Elena had initially sent me unsolicited copies of her yearly marketing calendars over a period of many years. Fortunately, when I recently decided to divest myself of my condo, she was the first person to come to mind, even though we had never spoken to one another. I can truly say that with Elena as my resource, I hit the jackpot on my first and only selection. After contacting Elena and scheduling our first meeting, It was smooth sailing for me thereafter. She literally oriented and educated me on every aspect I needed to know about the sales process and the decision considerations that I needed to make. I felt totally confident in providing her with the free reign to exercise her judgment in doing the job I asked her to do and to reach the objective that we had partnered to accomplished. As I stated, I hit the jackpot with Elena and, I am forever grateful for her integrity, capabilities and overall professionalism throughout the successful conclusion of the sale of my condo. Based my experience, Elena comes very highly recommended!" "I was anxious about selling my Skyline Plaza condo, but Elena seemed so knowledgeable and familiar with the Skyline community that I was reassured. She gave me a thorough lesson in the Skyline community, then asked me to estimate how much my condo should sell for. Because I was so well informed, I guessed the exact price she had chosen! She educated me, encouraged me, and led me by the hand through the process. She even answered a text from me when she was in Russia! Elena sold my condo in one day for more than asking price. She lives, breathes, and eats real estate! " "Elena is a stellar listing agent. She approaches every client interaction with enthusiasm and professionalism. She came to our first meeting well-prepared with information to support her recommendations, and approaches negotiations with a great deal of skill and confidence. She also takes care of her clients-- she lined up painters, photographers, and the cleaning crew. She even brought in items for staging, which is above and beyond the other agents that I interviewed. She works hard, and the energy that she puts into the listing helps build and keep momentum going all the way through to the closing. Thank you, Elena!" 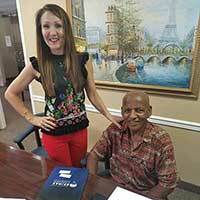 "Elena did a fantastic job in selling our condo. When we first engaged her, Elena knew the history of our property and what we needed to do to sell. The advice and strategy she provided worked exactly as she described. Elena exceeded our sales deadline and return on investment. She is prompt, reliable and extremely hard working. Elena was quick to get the property marketed, personally hosting open houses, and kept me notified at each step of the process. No one is better in the Skyline real estate market than Elena Gorbounova." Carrolle R. and Edward C.
"We bought in 2006 at the absolute peak, right before the housing crisis, 10 years later we were still under water. After 12 years, we were considering selling but after consulting realtors, we decided against it. Then we met Elena who initially told us the same details as the others, but was the first to work with us and the first to have a positive view that we can get as much for our place as possible, based on her strategy and market expertise. Elena had the in-depth knowledge about fees and price points which put us in an ideal spot, she even cautioned us AGAINST lowering our price. The strategy worked and we were relieved to get the sale for the amount that fit our budget. Working with Elena was a true pleasure-- we NEVER felt neglected and she was more responsive than any realtor we've ever worked with. She also knew how to effectively utilize open houses, and other marketing strategies, and how to effectively utilize staging materials and strategic repairs that wouldn't break the bank. All led to a successful sale. Highly recommend." "Thank you so much Elena! It has been such a pleasure and you made this whole experience simple and easy for us. We really appreciate it a lot. We do look forward to working with you again in the future! Elena was super helpful throughout the whole process. She really made it easy for us by explaining everything and checking in on us to make sure everything is good and that we were comfortable. The whole process was so timely and efficient. Elena was professional and is very skilled in the real estate business."